A newly created position at the Inner City Pastoral Ministry is reaching out to the Aboriginal population. 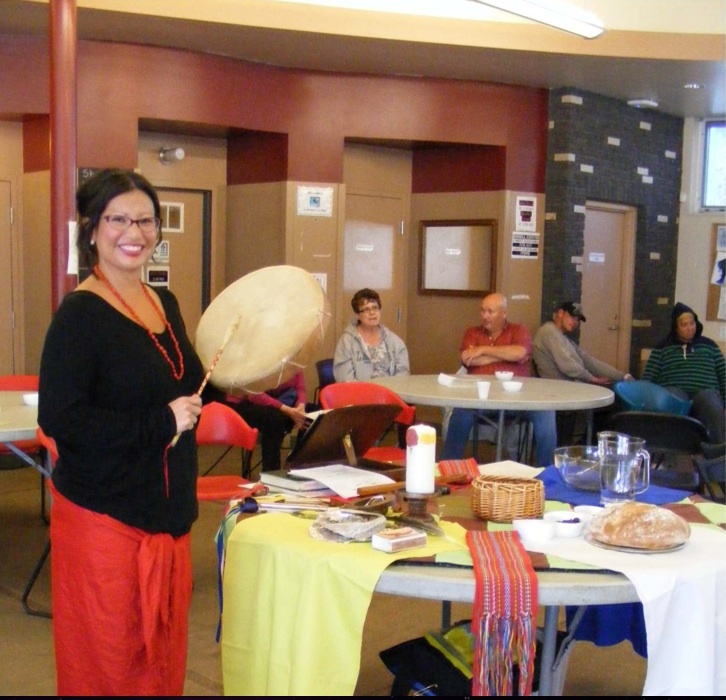 “As a Cree woman, I see myself and my role in the ICPM as an oskapew to Pastor Rick (Chapman) as well as the inner city community,” said Michelle Nieviadomy. ICPM is an interdenominational Christian outreach that meets in the Bissell Centre in downtown Edmonton. The position of oskapew, meaning “helper” in Cree, “was created in response to the need to develop more fully Aboriginal/non-Aboriginal relations with in the inner city and wider faith community of Edmonton,” said Chapman, director of ICPM. As nearly half of the people ICPM is in contact with are Aboriginal, the ICPM felt the position would be a fitting response to the Truth and Reconciliation Commission’s call to forward relations between Aboriginal and non-Aboriginal within the community, says Chapman. Nieviadomy was involved with ICPM prior to taking up her new position. “In my own desire to find a faith community, I was drawn to the Sunday service at the Bissell. Quite simply, I started to attend church which then turned into some volunteering. From that, dialogue between Pastor Rick and myself about the possibility of having a role specifically focusing on the Indigenous community which completely aligns with my own faith,” she said. Nieviadomy duties as an oskapew include being present at ICPM’s Sunday services and helping in a number of capacities, including writing and presenting sermons. Once a month, Nieviadomy also leads the Standing Stones service, which is stepped in Aboriginal traditions. “It is a beautiful service done in the Four Directions. Standing Stones honours the Indigenous way of expressing one’s faith,” she said. The service always begins with smudging and Nieviadomy sings some drum songs, as well as and sharing stories and teachings. Nieviadomy has had a positive reception from the inner city Aboriginal population. “The Aboriginal community is delighted with Michelle’s presence, with many coming forward to offering to share something of their story and spiritual life. The wider community is also very much desirous of Michelle’s presence as there is a strong desire within the faith community to learn, reconcile, and heal. Michelle is able to move freely in both communities with comfort,” said Chapman. The oskapew position has been contracted until the end of 2015, with the possibility of further growth being explored. It is not a full-time position for Nieviadomy, who graduated with the BA in Social Sciences at Kings University College and is the assistant director of the Edmonton Native Healing Centre. She also has her own business, Iskwew Health and Wellness, through which she teaches fitness classes. However, ICPM holds a special place for her. “It is an absolute honour. To be able to work with Pastor Rick who is truly for the community and the people, has been inspiring! The team also exemplifies such love and care for the inner city community - they are the true heroes!” she said.